Deep Blue Divers is a fully equipped, latest technology diving center which has high quality “ SCUBAPRO ” diving equipment as well as authorized service for the above. 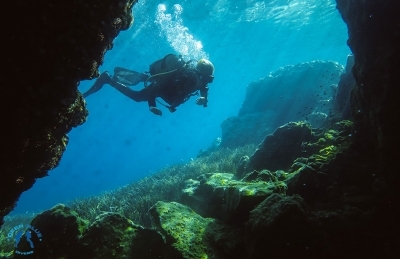 Deep Blue Divers diving center is at the main square of the picturesque village of Syvota, Thesprotia, famous for its natural wealth and beauty. One can pair his favorite hobby with his summer vacations in a group of small islands full of exquisite beaches and an all-green landscape overhanging the blue sea. 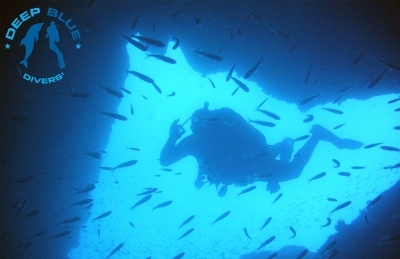 The diving center is a magnet for the fullfilment of stress relieving entertainment as well as a data bank for diving . Taking part in an entertaining dive touches all human senses augmenting our receptive ability and interpersonal trust getting us ready for the absolute sense of an underwater trip. The visit of the underwater world in the company of Deep Blue Divers is an unprecedented experience with multiple aesthetic discoveries in every one of our activities. Safety is of paramount importance in our diving center. Prevention is the beginning of everything. Safety is invaluable and the safety measures taken are sometimes boring for some people. 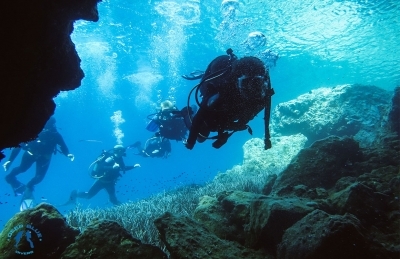 For the staff of Deep Blue Divers it is the rule and it is followed to the letter. Water is my favourite element.. I like to feel it, to move and breathe in it while observing or dreaming.. It’ s not easy to find people who share the same feeling for it.. Diving with Alexandros is a wonderful experience.. not just because he is passionate about the deep sea and the sealife.. but because he guides quitely , he gives you space and time to explore and take initiative into the water, he is like a silent and protective guard . This kind of diving is so similar to a nice yoga class. You find yourself in a neutral place and time where you can meet your true essence without limits . You let yourself go with the flow. I truly adore this feeling . I am so happy for yesterday ‘ s diving experience! Thank uuu!!! Wonderful, knowledgeable dive guides and really fun people. They made our visit to Greece so enjoyable. We would love to return and dive with them again! Not only great diving but also great and awesome people! we had an awesome time and so much fun!! A must go if you’re in for great dive and fun. you find the most qualified, happy and fun people here!! Excellent dive school, we did two fantastic dives (one night dive). Very friendly, encouraging, fun and importantly safety conscious. Thank you! We have been diving at divecenters in various parts of the world and Deep Blue Divers is one of the most professional ones, both concerning safety regulations and service. The equipment is top nodge and the instructors very professional. Thanks to Alexandros for 2 fantastic dives yesterday! We will for sure be back!